I will not feel guilty. I will not. I will not feel guilty if my nails are not polished. I will not feel guilty if my nails are polished. I will not feel guilty if I put lipstick on. I will not feel guilty for not putting lipstick on. I will not feel guilty if I did not manage to grade that paper tonight. And I will not feel guilty for grading that paper, instead of cooking dinner, tonight. I will not feel guilty if my kids ate a frozen burrito for dinner. And I will not feel guilty if they did not eat the frozen burrito. For once, I will not feel guilty for not being a man. For once, I will not feel guilty for being a man. I will not feel guilty for being taken less seriously than my male colleagues. And I will not feel guilty for being taken as seriously as my male colleagues. I will not feel guilty for spending three hours cooking an organic, hand-made pasta with macrobiotic homegrown fresh tomatoes and basil for my kids. I will not feel guilty for not devoting all of my time to my kids. I will not feel guilty for devoting all of my time to my kids. I will not feel guilty for devoting all of my time to my work. I will not feel guilty for not devoting all of my time to my work. I will not feel guilty for being a heterosexual cis-gendered woman married to a heterosexual cis-gendered man. But I will also not feel guilt for not being a heterosexual cis-gendered woman married to a heterosexual cis-gendered man. I will not feel guilty for those extra 10 pounds I have put on. And I will not feel guilty for feeling guilty for those extra 10 pounds. I will not feel guilty for not being able to wear my favorite blue jeans. And I will not feel guilty for looking at them with the desire to still be able to fit them. I will not feel guilty. For that one day at least, I will not. 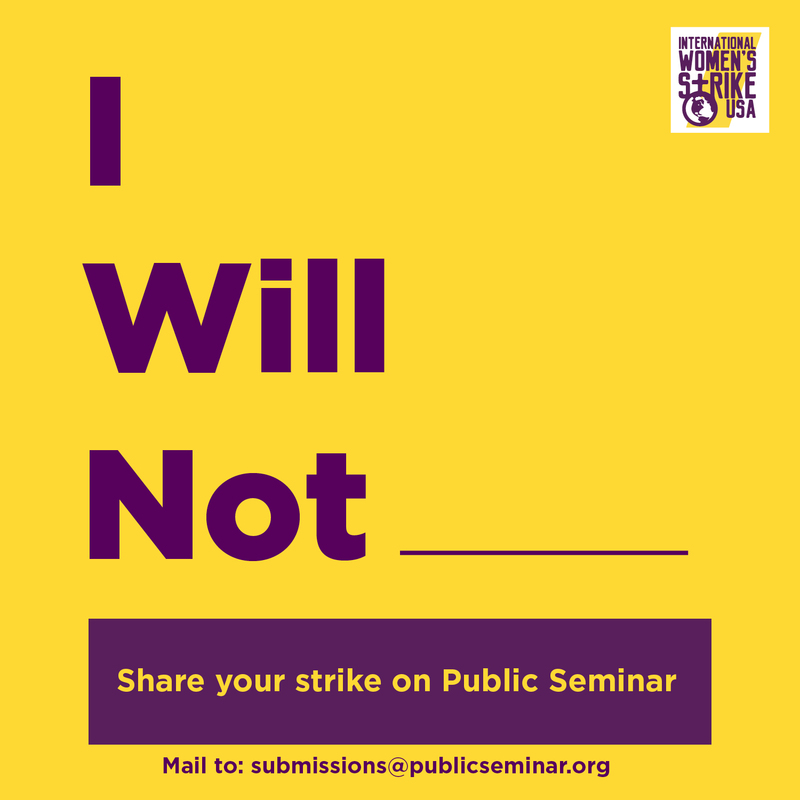 I will be on a strike against all oppressors, including myself. I will not feel even guilty for hiring a baby-sitter from the Global South to look after my kids as I teach my philosophy class. I will not feel guilty. But I will feel I am one with all of them, all and every women, all those who have been called “woman” in the past, who will call themselves “woman” in the present, and who will decide to no longer be called “woman” in the future. Associate Professor of Philosophy at The New School for Social Research.